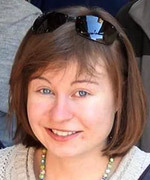 April 14, 2017 - Hannah Bladon was killed in a stabbing attack on while travelling on Jerusalem's light rail. Hannah Bladon, a 21-year-old British exchange student at the Hebrew University of Jerusalem, was killed in the stabbing attack near the Old City in Jerusalem, which took place on Friday, April 14 2017. Two other passengers were injured. The terrorist, an apparently mentally unstable man from East Jerusalem, was apprehended at the scene. The attack took place in a light railway car near Tzahal Square. Magen David Adom emergency response paramedics performed CPR on Hannah, who had been stabbed multiple times. After the paramedics performed the CPR she was rushed to the Hadassah Medical Center on Mount Scopus, where she was later pronounced dead. Hannah Bladon was studying at the Hebrew University in Jerusalem as part of the student exchange program with the University of Birmingham, where she studied theology. According to the university, Bladon, born in 1996, began her studies in Jerusalem in January 2017 and was scheduled to remain through the end of the semester. She had been taking bible studies, archaeology and Hebrew classes.